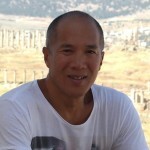 Charlie Teo is an inspirational neurosurgeon, pushing the boundaries to the point where the medical fraternity shun him. He gives people hope, time and life. Charlie is an internationally acclaimed neurosurgeon and a pioneer in keyhole minimally invasive techniques. He founded the Cure Brain Cancer Foundation (formerly the Cure for Life Foundation) in 2003, which, for the last 10 years, has been the largest funder of brain cancer research in Australia and which supports the Neuro-oncology wing of the Lowy Cancer Centre. As passionate about teaching as performing surgery, Charlie has been awarded Best Teacher awards in both the USA and Australia and devotes three months of every year instructing and doing live surgery pro bono in developing countries. In 2013, he was the first non-politician Australian to address the US Congress on the need for more funding for brain cancer research. Charlie is a father to four beautiful girls, husband to a very understanding wife, Genevieve, and supports the rights of girls and young women in impoverished countries through various charities including the Teo Family Foundation.